NELLY, along with her babies Mumu and Milly, were found wandering the streets of Puerto Rico, in need of food, water, and love. They spent most of their time on a busy street corner, in the then still hurricane-ravaged city of Fajardo. The volunteers from Hearts and Tails Animal Alliance were instantly intrigued by the calm, sweet, trusting trio. Unable to rescue them immediately due to the shelters being over capacity, we could only feed them and monitor their progress. After going back to visit to feed them several times, the Hearts and Tails volunteers eventually met a family who lived nearby who shared more of their story. Incredibly, the pups weren’t actually Nelly’s. This beautiful little momma had, sadly, lost her litter of newborn pups during Hurricane Maria. Around the same time, another female dog died due to complications while giving birth to her puppies, Mumu and Milly. As fate would have it – Nelly was right there, and had the courage and fortitude to take them in as her own, in spite of the fact that she herself was starving. 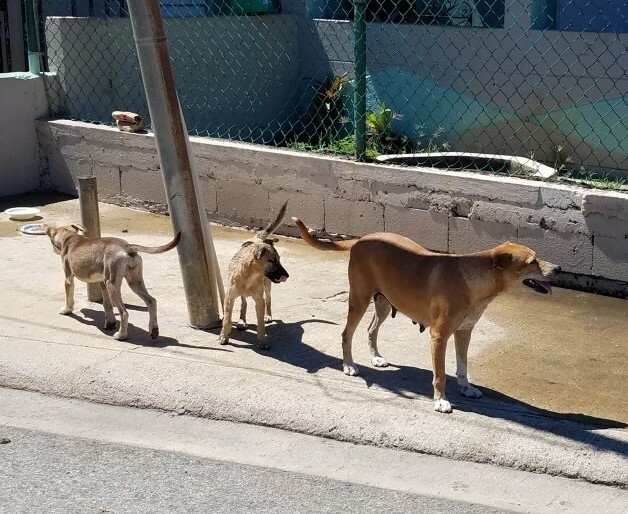 It took a couple of months before one of the shelters had enough room to offer Nelly and her surrogate pups a temporary home, so the Hearts and Tails folks continued to feed them in the streets and give them what limited medical attention could be offered in the interim. The joy that Nelly and her little family showed each time made it heart wrenching to walk away, helpless in the knowledge that there was no room for them at the shelters. She clearly loved her pups, and was also craving human affection and attention. Nelly is very special girl; completely trusting, and happy to connect with everyone she meets. It was a joyous occasion when we were finally able to move Nelly and her family into the shelter in Puerto Rico, to begin their long journey with Hearts and Tails… from the streets, to the Amigos de los Animales Shelter in Puerto Rico, and finally, back into the loving arms of Hearts and Tails. Previous Post Some of our Faves Arrive in NH! Enter your email address to subscribe to receive news and updates on our efforts by email. ©	2018 Hearts and Tails Inc. All rights reserved.